On July 18, 2018 a passenger flying to LAX noticed the bright lights out the window. He did a second take because he first thought it must be a reflection. 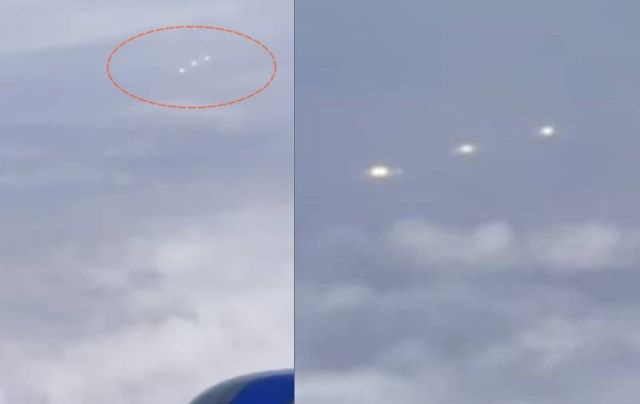 Passenger: Used my Iphone 10 to record it and could tell almost immediately it was in fact an actual object(s). The lights would go in and out of the clouds, change elevation and location from my particular viewpoint. I’m assuming it took place over Nevada based on the time. If you look closely, a white blinking light appears randomly both in front and behind the object. This object when viewed by human eyes was white and glowing. Lost sight of it after 5 or 6 minutes as it slowly went behind the wing. In a commercial airline so was traveling at least 500mph. I felt beyond excited because I knew then I was seeing something strange and was grateful to have the foresight to record it. I have submitted the footage to Mufon.